A delightfully strong lavender flavored treat. Preheat the oven to 350°F. Place the oven rack in the middle of the oven. Cover a large baking sheet with parchment paper and set aside. Sift the flour, baking powder, and baking soda into a small bowl. In a large bowl, whisk the sugar and eggs to a light lemon color and stir in the honey, vanilla extract, orange zest, and lavender. Sift the dry ingredients over the egg mixture and then fold in until the dough is just combined. Do not overmix. Mold half the dough into a 3-inch-wide log on the prepared baking sheet. Do the same with the remaining dough. Flour your hands, quickly stretch each portion of dough into a rough 13 by 2-inch log, placing the logs about 3 inches apart on the cookie sheet. Pat each dough log to smooth it. Bake, turning the pan around once about halfway through the baking time, until the loaves are golden and just beginning to crack on top, about 35 minutes. 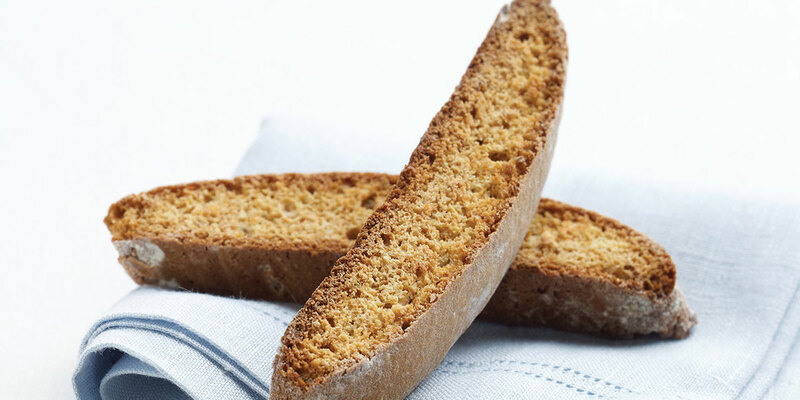 Remove the biscotti from the oven and lower the oven temperature to 325°F. Let the loaves cool on the pan for 10 to 15 minutes. Use a serrated knife to cut each loaf diagonally into 3/8-inch slices. Lay the slices about 1/2 inch apart on the cookie sheet, cut side up, and return them to the oven. Bake for 7 to 8 minutes. Turn over each cookie and bake for another 7 to 8 minutes, until the biscotti are crisp and golden brown on both sides. Transfer the biscotti to a wire rack and let cool completely. Biscotti can be stored in an airtight container for up to one month. If you prefer something milder, reduce the lavender or use herbes de Provence, which contains just a little lavender.